It is rather curious but the high pass filter doesn't grey out when selected for some photos. It works for the photos in question on the 1.6.5 version but not on the 1.7 beta. Could you upload the one or two images that are affected by this to our private Dropbox folder please? I'm afraid I might be missing what you're saying. 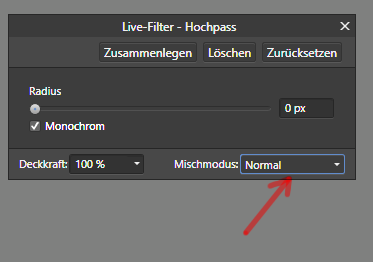 When you say 'greyed out' do you mean the ability to add the High Pass is greyed out with this image selected, or when you apply the High Pass, the image isn't greyed out what the Radius slider is to the left? The High Pass window appears. Irrespective of where I move the radius slider the image does not go grey. It remains coloured and unaffected. It is just a guess, maybe you have not set the blend mode to normal. I don't have that option. Just apply or cancel. That is the same for both the 1.6.5 and the 1.7 beta versions. The only difference being that with the 1.6.5 version the image greys out. Try the second option, are you still unable to "grey out" your images? I'm still convinced that another blend mode is used. also version 1.6.5 has this blend mode, at least in the Windows version. I tried Carl123's suggestion and used Layer > New Live Filter Layer > Sharpen > High Pass Filter (Beta 1.7). I had previously used the Filters > Sharpen > High Pass path. And everything worked as it was supposed to! No adjustment need. Normal automatically selected. Perfect grey out. Immediately I closed the image then reopened it and tried the Filters > Sharpen > High Pass path again. And this time that worked also. To check I exited the programme, restarted and tried Filters > Sharpen > High Pass path yet again. Again it worked. I have no explanation for this. I must have tried twenty times before and each time it failed and now seemingly it works. Are you still experiencing this issue? Can you post a screenshot of the app interface with one of the images that aren't working for you opened and the Layers panel visible please? Thanks.